﻿ Island Beach Bungalow, Lombok | FROM $23 - SAVE ON AGODA! "Large breakfast included, pool facilities open 24/7, speedy..."
Have a question for Island Beach Bungalow? "Had an amazing time at the pool with the family in the evening." "Best service i had over the 5 stay i have been in lombok ." "Clean room and super friendly and helpful staff ." The Island Beach Bungalow is a great choice for the ultimate vacation. Located in the center of Lombok, the bungalow is a great accommodation for your adventures around town. It provides a variety of convenient services, which include daily housekeeping and laundry services. It is close to landmarks and attractions such as Gili Trawangan, Shark Point Dive Location, Majelis Taklim Nurul Ikhsan Muslim Gathering, Gili Meno, and Gili Air. All of the rooms come with air conditioning, towels, and an umbrella, as well as a closet, a seating area, and a shower. The Island Beach Bungalow offers a halal restaurant, restaurants on-site, and room service, so there is a range of dining and snacking options. There's free Wi-Fi in all rooms, as well as Wi-Fi in common areas, so guests can connect with their friends and family back home without overspending on international charges. The bungalow accommodates pets, saving you the trouble of finding someone to look after your pet while you're on holiday. Check-in is offered from 02:00 PM until 08:00 PM, and check-out is from 11:00 AM to 12:00 PM. The nearest airports are Lombok International Airport (LOP) and Ngurah Rai International Airport (DPS), which are 51.3 km and 105.9 km away. "The boys made me feel so welcomed." We stayed three nights at Island Beach Bungalow. The property is amazing! In the middle of palm trees forest. It's so quiet. The pool was amazing. The staff is very friendly and always happy to help us. I recommend it! To make up for their location they hand out bicycles so getting to the shore aka main street isn't a problem. It even brings an element of fun and adventure which I liked. The bungalow interior is great, and the whole place feels fresh and newly built. There's no mould or such. The personnel is very lovely and helpful. Breakfast is good and consists of several options. We had a wonderful stay here. It was nice and quiet away from the main road but very close to get to restaurants. AC works well and breakfast was delicious. It is a very simple hotel with great service. Bikes are provided with your room which helps to get around the island. Overall great stay! location was the biggest drawback. getting there was inconvenient due to the dark, unpaved roads. the resort however did provide guests with free bicycles to help move around, which was great. the resort was beautiful and the cottages were spacious and comfortable. Staff was exceptionally friendly. Location is quiet, but not far from the sea (turtle area is vey close) and "center"; we get even bikes for free. Bungalows are new, very clean and comfy, great bathroom, fast wi-fi and very good air.con. Breakfast too much, we order just one time full set menu; this was far too much food-)). Great and friedly staff. Thanks a lot, wish we could stay longer!! The staff here were amazing! So friendly and helpful! They made us feel so welcomed. The location is a bit far from the beach/shops. It’s hard to find at first with not many signs but it is nice and quiet since it’s far away. Pool was great. Bungalows were very clean, new bottles of water everyday. Good selection for breakfast. No fridge in the rooms but a shared one outside. Always had to log in to the wifi every time your phone locked and it was a bit slow. We stayed for 6 days and it was lovely. The pool is well maintained. The staff are super nice and kind. The breakfast was not bad. They let you borrow the bikes for free so that’s a plus. It’s located a bit far from the port and the street to get to the hotel is kind of rough, but you will get used to it. The guys who run this hotel are phenomenal. We ended up extending our stay with IBB an extra night because of their hospitality and the comfort of the rooms. Not only would I recomend this room to friends, strangers and the works but I will ensure to be back for another stay the next chance I am in Indonesia. 10/10. Large breakfast included, pool facilities open 24/7, speedy wifi, comprehensive and friendly staff members, pristine rooms and great pressure hot showers. 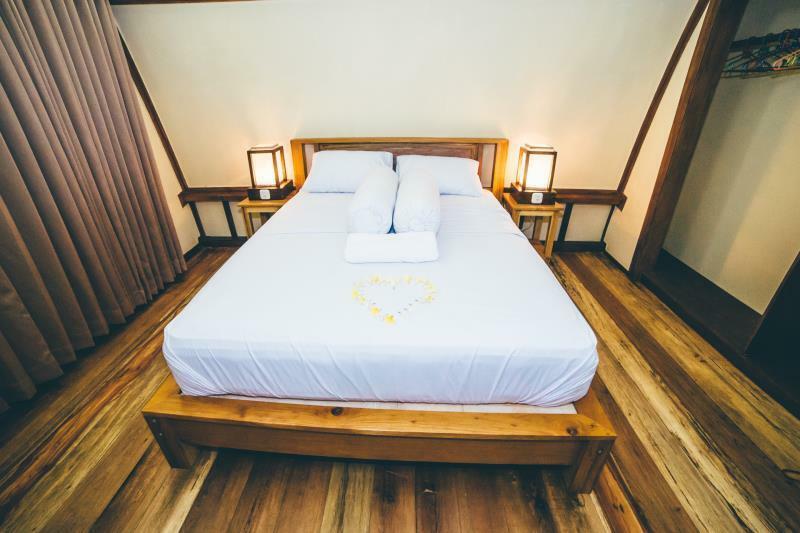 The place is formed by a small group of handmade lovely bungalows, each with private access, bathroom and a complementary bike per person to use for all the duration of your stay. The accomodation has every comfort, WIFI, air con, and safe. The swimming pool is very nice and well maintained and the staff is always available to every sort of requests. We had the breakfast option as well, and food was fresh and delicious, with fresh juices every morning. The location is not on the main road, I would say 5 minutes by bike, and the road is a bit dark at night, even though the island is quite small so you don’t need to worry about long night trips. I would stay again, recommended. Very beautiful and peaceful place. Hosts are just so nice and open for anything you need during your stay. Bungalows are not very big but enough to have a pleasant and relaxing stay. Hot shower. Amazing swimming pool. Bicycle rent for free. Air conditioning. Great breakfast. so nice staff, wonderful swimming pool, clean and the comfortable room, good wifi, good and free bike, cute breakfast~~everything was perfect except the location. There is no light in the alley. Totally dark~you have to bring your flash light. But so it is calm and peaceful~ It was so good. beautiful bungalows, you're sitting here not far from the busiest street. And you will not notice anything of the busy nightlife on the island. during my trip through Indonesia this was one of the highlights, as far as hotels are concerned. Staff is very friendly and helpful, the breakfast is delicious and you get a lot. from 4 to 6 they serve coffee and tea. definitely a must to try the coffee from lombok, delicious natural taste. The staff was incredibly helpful and catered to our every wish. And we didn’t make it easy on them since we lost our key the first day, after we could check-in 2 hours early. The Bungalows are new, nicely furnished and clean. The pool is amazing and the whole resort feel is great. Would definitely stay again. Great friendly awesome staff Breakfast was delicious Place was outstandingly clean Provided beach towels and shower towels Provided a free bike for getting around the island ( with flashlight for night) would stay here in a heartbeat!!! Amazing place to stay. It's not too close to the beach but it was good as the party noise didn't reach there but the beach is still walking distance. They also had bikes included with room so we didn't have to rent it. Had an amazing time at the pool with the family in the evening. Staff was really friendly and the rooms super cute. Absolutely loved it there I would definitely recommend . The location is perfect, away from the noise, but close to the beach and restaurants, by bike as the hotel rents for free. The rooms were clean everyday and really nice. The pool was clean. The staff were really sweet to help with everything. They felt safe and secure with them. We have nothing bad to say about the place. Book this place if you are going to Gili T.